Driving U.S. 395 through the windswept Owens Valley of eastern California is an experience to remember. To the west, the Sierra Nevada towers more than 10,000 feet above you; to the east, the Inyo range is nearly as high. To the north, enjoy world-class skiing, hiking, and fishing at Mammoth and June Lake, or head south to explore the Alabama Hills, a favorite location of Hollywood moviemakers. You may not realize, however, that one of the most infamous chapters of U.S. history played out just west of Highway 395 between the towns of Lone Pine and Independence. 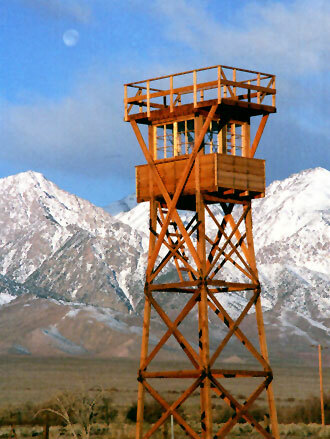 During World War II, 11,070 Japanese Americans were confined at Manzanar. Two-thirds were American citizens by birth. None had been charged with a crime. They were simply men, women, and children of Japanese ancestry living on the West Coast while the U.S. was at war with Japan. On February 19, 1942, President Franklin D. Roosevelt signed Executive Order 9066, ultimately allowing the U.S. Army to round up and confine 120,313 Japanese Americans in 10 camps around the country. 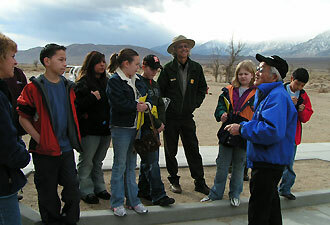 The national park system includes two camps in addition to Manzanar: Minidoka and Tule Lake. The National Park Service also manages the Japanese American Memorial to Patriotism during World War II in Washington, DC, and administers a grant program that helps preserve confinement sites and make people aware of their significance. Japanese Americans at Manzanar lived for up to three and a half years in a camp of one square mile, surrounded by barbed wire, guard towers, and Military Police. The National Park Service preserves this tangible place to allow visitors to explore intangible realities like love and hate, loyalty and betrayal, justice and injustice, and friendship. Visit Manzanar's extensive exhibit in the restored high school auditorium. Nearby, check out exhibits in a World War II-era mess hall or walk through two reconstructed barracks. Take a self-guided auto or walking tour to see foundations, rock gardens, stone alignments, and historic orchards. Before or after your visit, explore Manzanar's virtual museum. 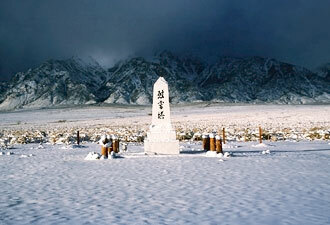 If you visit the Manzanar cemetery on the last Saturday in April, you'll be joined by more than 1,000 others for the annual Manzanar Pilgrimage. Any other day of the year, you're likely to find a quiet space to contemplate the 541 lives that began at Manzanar, the 150 that ended here, and all of the others touched by this place. Travel U.S. 395, enjoy the scenery, and take a few hours to contemplate our Constitution and the protections it promises at a place where — not so long ago — they were largely forgotten. For more information, please call 760-878-2194; write to Manzanar National Historic Site, PO Box 426, Independence, CA 93526; or visit our website at www.nps.gov/manz.